Pfizer announced that the FDA has approved Bosulif (bosutinib) for the treatment of adult patients with chronic, accelerated, or blast phase Philadelphia chromosome-positive (Ph+) chronic myelogenous leukemia (CML) with resistance, or intolerance to prior therapy. The registrational trial (Study 200) was a global, single-arm, open-label, multi-cohort, Phase 1/2 study of >500 patients with imatinib (Gleevec; Novartis)-resistant or –intolerant Ph+ CML with separate cohorts for chronic, accelerated and blast phase disease previously treated with one prior TKI (imatinib) or more than one TKI (imatinib followed by dasatinib [Sprycel; Bristol-Myers Squibb] and/or nilotinib [Tasigna; Novartis]). The major cytogenetic response (MCyR) at 24 weeks for patients with chronic phase CML who had been previously treated with imatinib only (n=266) was 33.8% (95% CI: 28.2, 39.9). With a minimum follow-up of 23 months, 53.4% of patients achieved a MCyR. Of patients who achieved MCyR, 52.8% had a MCyR lasting at least 18 months. The median duration of MCyR was not reached for these patients. The MCyR by 24 weeks for patients with chronic phase CML who had been treated with imatinib and at least one other TKI (n=108) was 26.9% (95% CI: 18.8, 36.2). With a minimum follow-up of 13 months, 32.4% of patients achieved a MCyR. Of patients who achieved MCyR, 51.4% had a MCyR lasting at least nine months. The median duration of MCyR was not reached for these patients. A low rate of transformation (4%, n=16) from the chronic phase to the advanced or blast phase was also observed in patients treated with Bosulif. 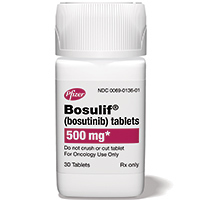 Bosulif is a kinase inhibitor that limits cancer cell growth by inhibiting the Abl and Src signaling pathways. Bosulif is expected to be available mid-September. It will be available as 100mg and 500mg tablets. For more information, call (800) 438-1985 or visit www.pfizer.com.